The "Make My Day" law in Colorado allows homeowners or occupants to use deadly force against individuals who enter their dwellings unlawfully. 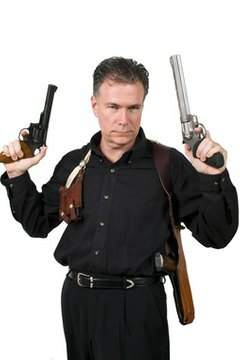 The law is detailed in Colorado Revised Statutes 18-1-704.5, titled "Use of deadly physical force against an intruder." Legislators approved the Make My Day law in 1985 in recognition of the fact that state residents "have a right to expect absolute safety within their own homes." The Make My Day law states that an intruder must enter into a home unlawfully in order for the law to apply and for granting of immunity from prosecution to the homeowner or occupant. If a suspect only enters onto property grounds but not into the dwelling, the law is not in effect. Per CRS 18-1-704.5, using deadly force against an individual is also allowed when any person in the violated dwelling has grounds to believe the intruder has committed other illegal acts in the residence, is in process of or intends to do so, or if there is evidence the intruder intends to engage in violent behavior. An intruder, or his family members, cannot sue or seek civil remedy for the injuries or death that result from property owners or occupants who act in accordance with the Make My Day law. Actor Clint Eastwood made the "make my day" phrase popular in the 1983 movie "Sudden Impact." He played investigator "Dirty Harry" Callahan, who utters the words while pointing his gun at a criminal. IMDb: Plot Summary for "Sudden Impact"
Adeeba Folami is a freelance journalist residing in Denver, Colo. She was first published professionally in 1994. Folami's work has appeared in many publications, including "Denver Weekly News," "Afro American Newspapers," "Louisiana Weekly," "Dallas Weekly," "Mississippi Link," and "OpEd News." Folami, Adeeba. "Colorado Make My Day Law." , https://legalbeagle.com/6573279-colorado-make-day-law.html. Accessed 21 April 2019.